Opening up the doors for original, innovative, violent shows to live on basic cable networks, FX's The Shield—which premiered 15 years ago today—helped to change the TV landscape in the first decade of the 21st century. 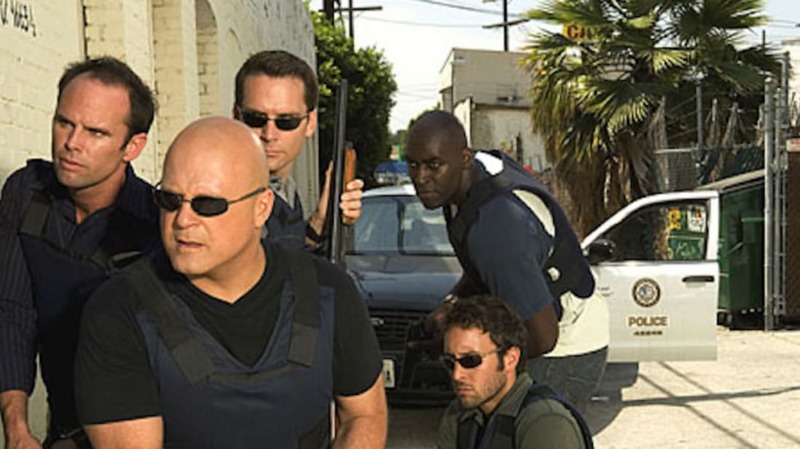 Starring Michael Chiklis as corrupt cop Vic Mackey, the show followed the Los Angeles Police Department’s "Strike Team," an anti-gang unit modeled after the real LAPD Rampart Division's CRASH unit. In 2003, it became the first ad-supported cable series to win a Golden Globe for Best Drama Series. Here are some facts about The Shield that are a different kind of cop. 1. THE CO-CREATOR OF LOST THOUGHT THE NETWORK WOULD CHANGE THE PILOT. 2. IT WAS ORIGINALLY TITLED THE FARM, THEN RAMPART. "The Farm" was the nickname for the fictional Farmington district, where the Strike Team was based. FX thought the title would confuse potential viewers. Rampart was named after the inspiration of the series—the LAPD’s Rampart Division, which became embroiled in a scandal when more than 70 police officers were implicated for murder, framing suspects, drug thefts, bank robberies, and planting evidence. 3. THE SUCCESS OF TRAINING DAY SAVED THE SHOW. FX officially greenlit The Shield on August 30, 2001. But following 9/11, network executives worried that the series might now seem inappropriate, given the political climate. But when Training Day, which came out on October 5, 2001, was met with great reviews and strong box office numbers, everyone involved with The Shield decided to proceed without fear of a backlash for portraying cops in a negative light. 4. ERIC STOLTZ WAS OFFERED THE LEAD. Eric Stoltz was offered the lead role and—and almost took it. FX wanted Eric Stoltz to play Vic Mackey. Made him an offer, almost took it. RT @crocdogg: what kind of story do you have about The Shield? 5. FX EXECUTIVES WERE NOT SOLD ON MICHAEL CHIKLIS. 6. CLAUDETTE WYMS WAS ORIGINALLY WRITTEN AS A MAN. Claudette Wyms was Charles Wyms in the original script. Creator Shawn Ryan changed his mind on the gender of the department captain after talking with CCH Pounder's agent. Pounder asked that Wyms' masculine dialogue not be changed at all. 7. THEY USED SOME GUERILLA FILMMAKING TECHNIQUES. While shooting the pilot, director Clark Johnson spotted a pack of stray dogs; he grabbed some salami from the craft services table, threw it into the frame, and yelled “Shoot the dog!” as the dogs ran to the food. In a season three episode, Chiklis threw himself into actual East L.A. traffic, with a Steadicam operator following him. 8. DAVID REES SNELL WAS PAID THE SAME AS AN EXTRA. Snell was a friend of Shawn Ryan’s, and agreed to play Detective Ronnie Gardocki for $85 per day (the amount paid to an extra) with the promise that he would get more lines in later episodes. Gardocki ended up in all but six of the series’ 89 installments. 9. FAMILY MEMBERS HELPED IN ROUNDING OUT THE CAST. Ryan’s wife, Cathy Cahlin Ryan, portrayed Vic's wife Corrine. Vic and Corrine’s oldest daughter was played by Autumn Chiklis, Michael’s daughter. 10. RYAN USED SAN FRANCISCO COP STORIES THAT WERE TOO DARK FOR NASH BRIDGES. Shawn Ryan rode along with San Francisco cops and put together a collection of “dark, twisted” stories he could never use for the Don Johnson-starring CBS series he was employed on. Ryan used them for The Shield, along with the Los Angeles Rampart police scandal plots. Ryan said that, structurally speaking, Nash Bridges and The Shield were "pretty similar." 11. THERE WAS A POSSIBLE NOD TO DRAGNET. Detective Shane Vendrell (Walton Goggins) had the same badge number as Detective Joe Friday on Dragnet, number 714. 12. GLENN CLOSE BASED MONICA RAWLING ON A COMMANDING OFFICER IN THE NYPD. 13. RYAN HAD THE IDEA FOR SERIES' END FOR A COUPLE OF YEARS. “I've actually had in my head for a couple of years, the idea of Vic in a suit, in an office somewhere, consigned to Hell," Ryan admitted in a post-mortem interview. "I knew that, but I had no idea how to get there." Ryan also knew he wanted to end the series on the Concrete Blonde song "...Long Time Ago." Vendrell’s ultimate fate was decided “around episode three or four” of the final season. 14. THE WRITERS WERE PICKETING WHEN THE SERIES FINALE WAS FILMED. While The Shield's cast and crew were filming "Family Meeting," the series' finale, the show's writers were picketing in support of the 2007-08 Writers Guild of America strike. "We still finished it the way we set out to, but what was missing was the familial aspect," Chiklis told the Los Angeles Times. "We weren't together to do it, and that was disappointing because we've been such a great team during the entire run of the series." Ryan was able to see his wife’s final scene by being the lone member of a one-person picket at the same place where Vic was checking in on Corrine and his kids for the last time. 15. THE LAPD WERE SECRETLY FANS. “If you asked the LAPD formally even now, they would still have to denounce the show to some degree," Chiklis told The Telegraph in 2009. “But if you ask the rank and file, they love it—they’ll tell you it brings to life the ambiguity of the job. Things aren’t as cut and dried as people like to think—sometimes things get dodgy." This post originally appeared in 2016.